It should be a Happy Halloween for fans of illegal street racing. The eighth season of the Street Outlaws TV show premieres on Discovery Channel, Monday, October 31, 2016, at 9:00pm ET/PT. Big Chief, Daddy Dave, Brian “Chucky” Davis, and Farmtruck. Craig Piligian and Sam Korkis executive produce for Pilgrim Media Group. For Discovery, Craig Coffman is executive producer and Todd Lefkowitz is coordinating producer. Check out this Discovery press release for more information. (New York, New York) – Oklahoma City’s most competitive street racers are hitting the concrete faster than ever when STREET OUTLAWS returns to Discovery Channel on Monday, October 31 at 9 PM ET/PT. The streets are swarming with determined racers who will stop at nothing to claim the top spot on OKC’s top 10 “List” of street racers. However, the level of competition intensifies as the rules of the game change and some of the most experienced drivers, who are now racing new cars, must start from the bottom. It will be a sprint to see which veteran “405” driver can make it to #1 first. Familiar faces are back at the starting line, but victory is far from arm’s reach. Farmtruck lines his truck up against anything and anyone – including a jet car, a monster truck and an actual jet – and for the first time in years, fights his way back onto the List. Chief, in his Crow-mod, and Daddy Dave, in his Goliath 2.0, battle it out at the bottom of the List, both hoping to claw their way to the top. In order to compete with the pro-mods coming for the List, 405 drivers Doc and Monza worked together during the off-season to make their cars as light as possible, ultimately losing more than 1,000 pounds off their vehicles. Brian “Chucky” Davis, of Detroit, also returns to the streets of the 405 with his new ride, but racers are nervous to line up against him after his crash with Chief earlier this year. Finally, it’s every man for himself until teams of racers from New York, Detroit and California all gather in the 405 for a first-of-its-kind team race-off. Tensions run high as fierce rivals are forced to team up, and most will stop at nothing to walk away with the cash and glory. STREET OUTLAWS is produced for Discovery Channel by Pilgrim Media Group; Craig Piligian and Sam Korkis are executive producers. For Discovery, Craig Coffman is executive producer and Todd Lefkowitz is coordinating producer. Discovery Communications (Nasdaq: DISCA, DISCB, DISCK) satisfies curiosity and engages superfans with a portfolio of premium nonfiction, sports and kids programming brands. Reaching 3 billion cumulative viewers across pay-TV and free-to-air platforms in more than 220 countries and territories, Discovery’s portfolio includes the global brands Discovery Channel, TLC, Investigation Discovery, Animal Planet, Science and Turbo/Velocity, as well as OWN: Oprah Winfrey Network in the U.S., Discovery Kids in Latin America, and Eurosport, the leading provider of locally relevant, premium sports content across Europe. Discovery reaches audiences across screens through digital-first programming from Discovery VR, Seeker and SourceFed Studios, as well as over-the-top and TV Everywhere offerings including Eurosport Player, Dplay, Discovery K!ds Play and Discovery GO. For more information, please visit www.discoverycommunications.com. Craig Piligian’s Pilgrim Media Group, a Lionsgate company, produces a wide variety of unscripted and scripted programming for television, including Street Outlaws, Fast N’ Loud, Misfit Garage and upcoming series The Wheel for Discovery; My Big Fat Fabulous Life for TLC; two-time NAACP Award-winner Welcome to Sweetie Pie’s for OWN; Ghost Brothers for Destination America; Ghost Hunters for Syfy; Bring It! for Lifetime; David Tutera’s CELEBrations for WE tv; Wicked Tuna and Wicked Tuna: Outer Banks for National Geographic Channel; and Zombie House Flipping for FYI. Pilgrim also launched The Runner, with Executive Producers Ben Affleck and Matt Damon, for Verizon’s go90 in July. In the scripted realm, Pilgrim produced Freeform series Recovery Road and original movies for Lifetime including Amanda Knox: Murder On Trial In Italy; Abducted: The Carlina White Story, which earned a 2012 NAACP Image Award for Outstanding Writing In A Motion Picture; and the crime thriller Stalkers. For more, visit pilgrimstudios.com. What do you think? Are you a fan of the Street Outlaws TV show? Do you plan to watch the eighth season premiere on Discovery Channel? Tell us. 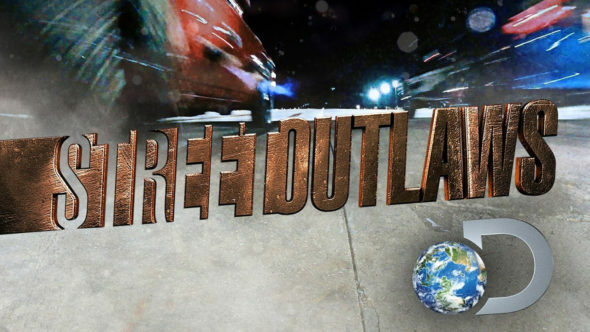 More about: Discovery Channel TV shows: canceled or renewed?, Street Outlaws, Street Outlaws: canceled or renewed?